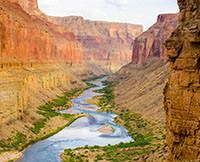 We traveled down the Colorado River through the Grand Canyon with Ben, Lane, Ronnie and Jeff. Every single element of the trip exceeded our already high expectations. The food was ridiculous, out of this world. I ate better breakfasts on the river than I get from my favorite local restaurants. Plenty of snacks, too. Was afraid I'd gained weight but came home to see I'd maintained. We hiked almost every day. I didn't know we'd get to do that much off the river, which was a really awesome surprise. There was more white water than I expected and the big ones didn't disappoint. Camping was also fun. The two biggest surprises: the amazing people we met and friendliness, fun and expertise of the guides. We can't say enough about how awesome our guides were, especially Ben, our group leader. They directed us but let us define our own experience. It was perfect. And, the friendships we made on the river were not something we expected. We had a really fun, interesting, unique group of folks on our raft and it absolutely made the trip. Before going, we thought this would be a once in a lifetime experience. We're certain it won't be. See you again!